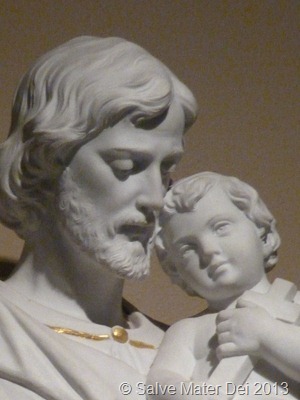 Wednesdays: Through the Holy Heart of St. Joseph: Patron of the Universal Church, Pray for Us! 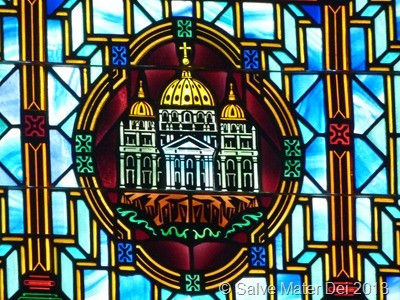 Perhaps at no other time in my nearly half-century of life have I felt the need to commend my beloved Holy Catholic Church to the tender care of the Holy Heart of her esteemed patron. In 1870, Blessed Pope Pius IX (Giovanni Maria Mastai-Ferretti ) declared St. Joseph to be the Patron of the Holy Catholic Church. A brief review of history demonstrates that the late 1800’s were indeed a turbulent time both in secular and ecclesiastic history. During the pontificate of Blessed Pope Pius IX, the longest reigning Holy Father in history (32 years), the First Vatican Council was convened from 1869-1870 to counter-act the rising tide of materialism, rationalism, and liberalism. 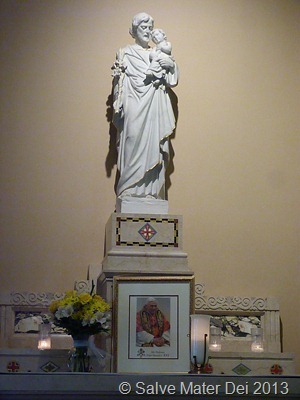 The dogma of the Immaculate Conception was declared in 1854, and the doctrine of Papal Infallibility was defined as a fruit of the First Vatican Council. Secular global history was marked by revolutions and changing borders. Truly, the intercession of a powerful advocate was necessary. As tempestuous as history demonstrates that period of history to have been, today we are faced with even greater trials. 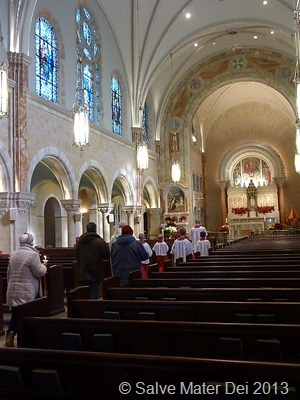 Faithful Catholics are confronted daily by a myriad challenges – both from the secular world and sadly also from within the community of believers. One has only to glance at the media feeding-frenzy that has taken place since the resignation of Pope Benedict XVI to witness a vivid example of these assaults to the Faith. 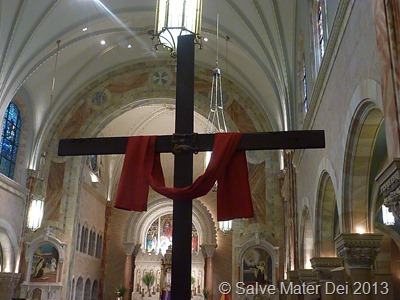 The Gates of Hell Shall not Prevail Against It © SalveMaterDei.com, 2013. While devout Catholics have approached these finals days of his pontificate with both a sense of gratitude for the magnificent blessing Pope Benedict XVI has been in our lives, and ardent prayer for an outpouring of the Holy Spirit to guide the Bride of Christ into future, we have had to struggle for a sense of peace amid the bombardment of media distractions and a noisy din of secular speculations, Vegas bookies, and conspiracy theorists. 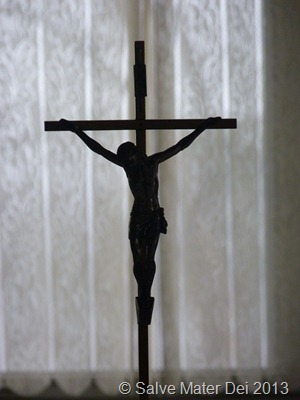 A dear friend and Carmelite friar offered a sage piece of advice last week. He noted that as Catholics we are invited by the Holy Spirit to approach this time as a mystery to be lived rather than a problem to be solved. 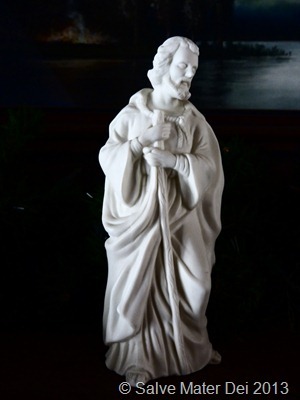 As we seek to embrace the mystery implicit in being members of the Mystical Body of Christ, let us together invoke the intercession of the Holy Heart of St. Joseph. 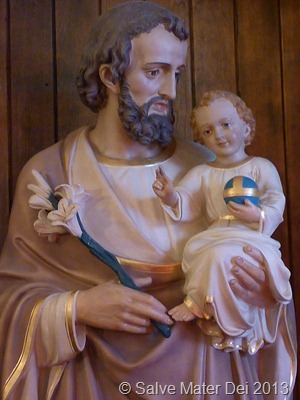 St. Joseph, Patron of the Universal Church, Please Pray for Us! 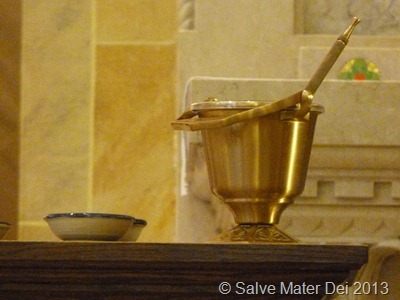 © SalveMaterDei.com, 2013. 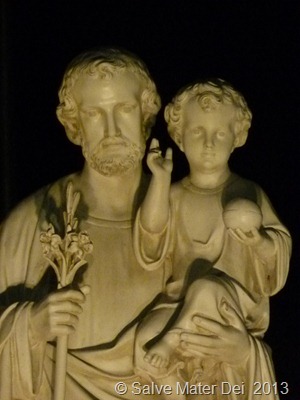 Dear St. Joseph, Patron of the Universal Church, we seek your guidance and invoke your powerful aid on this the eve of a decisive moment in the history of our beloved Catholic Church. With deepest gratitude, please thank our Heavenly Father for the abundance grace He has bestowed upon the Church, and especially upon the pontificate of Pope Benedict XVI. 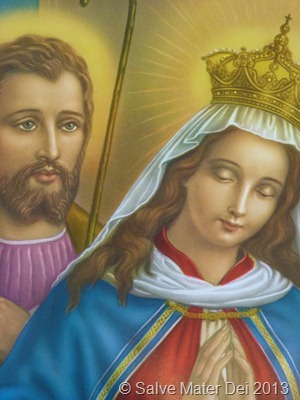 Through the Most Holy Name of Jesus, invoke a blessing upon the inviolate Bride of Christ, and pray that the fullness of the Holy Spirit will descend upon those charged with the responsibility to choose wisely he who will subsequently hold the Keys of St. Peter. 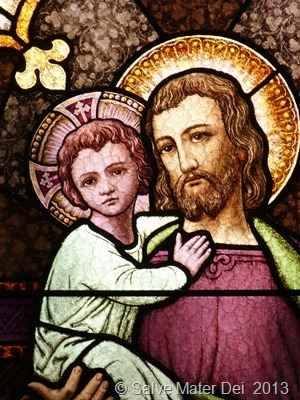 St. Joseph, powerful patron, please cradle the Holy Catholic Church close to your Holy Heart. 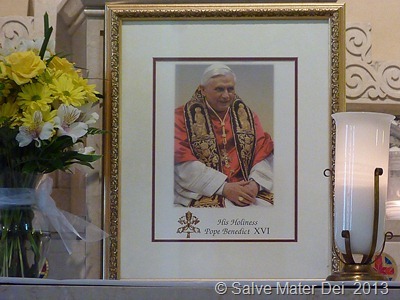 May God bless and reward our cherished Papa, Pope Benedict XVI! You are Peter! 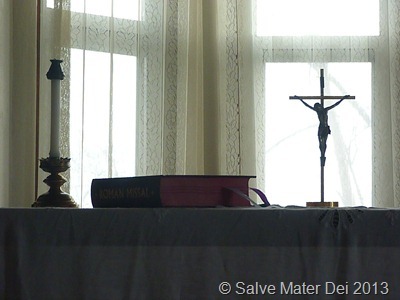 © SalveMaterDei.com, 2013. Venerable Brothers in the Episcopate and in the Priesthood! Distinguished Authorities! Dear brothers and sisters! At this time, I have within myself a great trust [in God], because I know – all of us know – that the Gospel’s word of truth is the strength of the Church: it is her life. The Gospel purifies and renews: it bears fruit wherever the community of believers hears and welcomes the grace of God in truth and lives in charity. This is my faith, this is my joy. 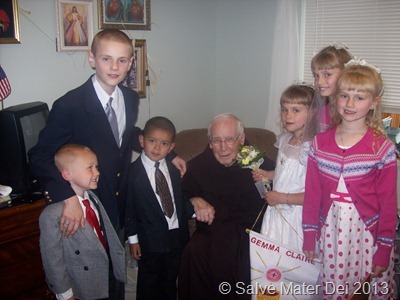 When, almost eight years ago, on April 19th, , I agreed to take on the Petrine ministry, I held steadfast in this certainty, which has always accompanied me. In that moment, as I have already stated several times, the words that resounded in my heart were: “Lord, what do you ask of me? It a great weight that You place on my shoulders, but, if You ask me, at your word I will throw out the nets, sure that you will guide me” – and the Lord really has guided me. 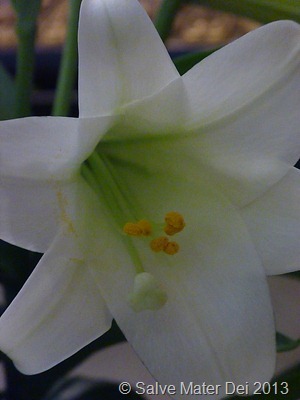 He has been close to me: daily could I feel His presence. [These years] have been a stretch of the Church’s pilgrim way, which has seen moments joy and light, but also difficult moments. I have felt like St. Peter with the Apostles in the boat on the Sea of ​​Galilee: the Lord has given us many days of sunshine and gentle breeze, days in which the catch has been abundant; [then] there have been times when the seas were rough and the wind against us, as in the whole history of the Church it has ever been – and the Lord seemed to sleep. Nevertheless, I always knew that the Lord is in the barque, that the barque of the Church is not mine, not ours, but His – and He shall not let her sink. It is He, who steers her: to be sure, he does so also through men of His choosing, for He desired that it be so. This was and is a certainty that nothing can tarnish. It is for this reason, that today my heart is filled with gratitude to God, for never did He leave me or the Church without His consolation, His light, His love. At this time, however, it is not only God, whom I desire to thank. 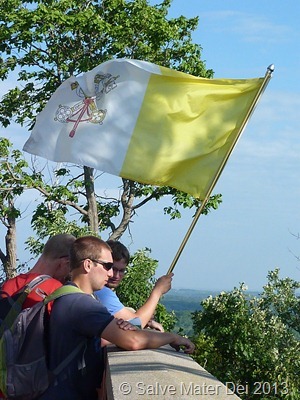 A Pope is not alone in guiding St. Peter’s barque, even if it is his first responsibility – and I have not ever felt myself alone in bearing either the joys or the weight of the Petrine ministry. The Lord has placed next to me many people, who, with generosity and love for God and the Church, have helped me and been close to me. First of all you, dear Brother Cardinals: your wisdom, your counsels, your friendship, were all precious to me. My collaborators, starting with my Secretary of State, who accompanied me faithfully over the years, the Secretariat of State and the whole Roman Curia, as well as all those who, in various areas, give their service to the Holy See: the many faces which never emerge, but remain in the background, in silence, in their daily commitment, with a spirit of faith and humility. They have been for me a sure and reliable support. 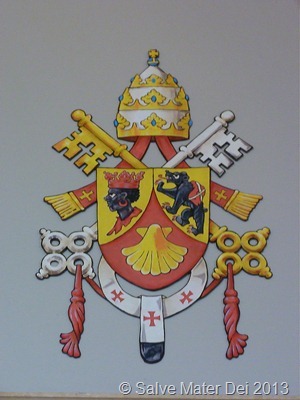 A special thought [goes] to the Church of Rome, my diocese! I can not forget the Brothers in the Episcopate and in the Priesthood, the consecrated persons and the entire People of God: in pastoral visits, in public encounters, at Audiences, in traveling, I have always received great care and deep affection; I also loved each and every one, without exception, with that pastoral charity which is the heart of every shepherd, especially the Bishop of Rome, the Successor of the Apostle Peter. Every day I carried each of you in my prayers, with the father’s heart. I wish my greetings and my thanks to reach everyone: the heart of a Pope expands to [embrace] the whole world. I would like to express my gratitude to the Diplomatic Corps accredited to the Holy See, which makes present the great family of nations. Here I also think of all those who work for good communication, whom I thank for their important service. At this point I would like to offer heartfelt thanks to all the many people throughout the whole world, who, in recent weeks have sent me moving tokens of concern, friendship and prayer. Yes, the Pope is never alone: now I experience this [truth] again in a way so great as to touch my very heart. The Pope belongs to everyone, and so many people feel very close to him. It’s true that I receive letters from the world’s greatest figures – from the Heads of State, religious leaders, representatives of the world of culture and so on. I also receive many letters from ordinary people who write to me simply from their heart and let me feel their affection, which is born of our being together in Christ Jesus, in the Church. These people do not write me as one might write, for example, to a prince or a great figure one does not know. They write as brothers and sisters, sons and daughters, with the sense of very affectionate family ties. 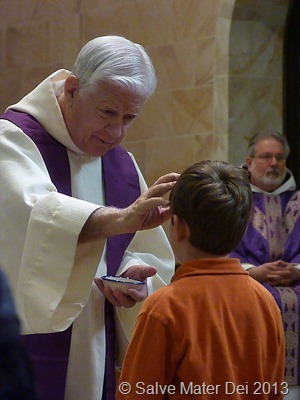 Here, one can touch what the Church is – not an organization, not an association for religious or humanitarian purposes, but a living body, a community of brothers and sisters in the Body of Jesus Christ, who unites us all. To experience the Church in this way and almost be able to touch with one’s hands the power of His truth and His love, is a source of joy, in a time in which many speak of its decline. In recent months, I felt that my strength had decreased, and I asked God with insistence in prayer to enlighten me with His light to make me take the right decision – not for my sake, but for the good of the Church. I have taken this step in full awareness of its severity and also its novelty, but with a deep peace of mind. Loving the Church also means having the courage to make difficult, trying choices, having ever before oneself the good of the Church and not one’s own. 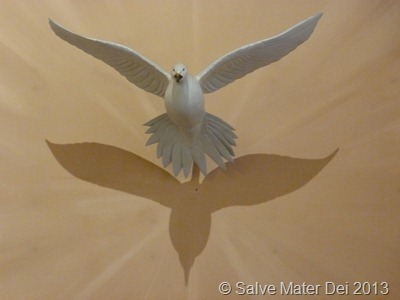 Let us invoke the Power of the Holy Spirit. 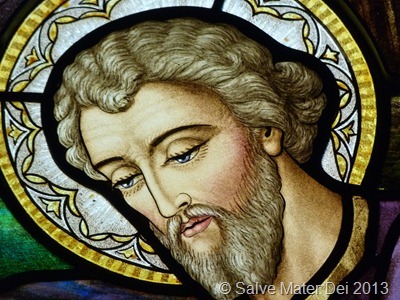 © SalveMaterDei.com, 2013. A Light for Revelation. 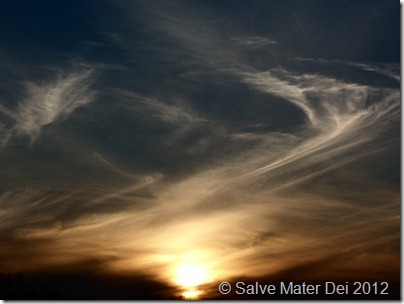 . . © SalveMaterDei.com, 2013. Now, Master, You may let Your servant go in peace according to your word, for my eyes have seen Your salvation, which You prepared in the sight of all peoples, a light for revelation to the Gentiles, and glory to Your people Israel, Lord (Canticle of Simeon, Nunc dimittis, Luke 2: 29-32). 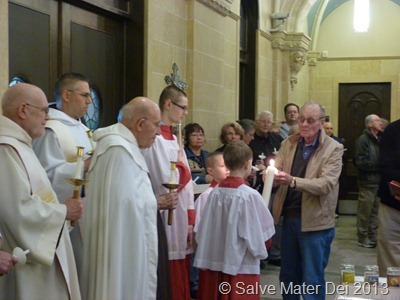 Yesterday, February 2, we celebrated the rich and ancient feast of Candlemas, which is commemorated in both the Western Roman Rite Church and as well as the Eastern Church. This liturgical festival is known under a variety of titles, and its early existence is verified in the homilies of many ancient bishops including: St. Methodius of Patara (C. 312), St. Cyril of Jerusalem (c. 360), St. Gregory the Theologian (c. 389), St. Amphilochius of Iconium (c. 394), St. Gregory of Nyssa (c. 400), and St. John Chrysostom (c. 407). In the Western Roman Catholic Latin Rite this feast is known as: The Presentation of Jesus in the Temple, the Purification of the Blessed Virgin, and the Presentation of the Lord. For the Eastern Orthodox and many of the Eastern Rite Catholic Churches, this feast is celebrated as one of the Twelve Great Feasts. It is the Hypapante which is Greek for “Encounter. As such, it celebrates the encounter of the Christ-Child and Simeon ( the Just Man) and the Prophetess Anna, as recounted in the Gospel (Luke 2: 22-40). For the Byzantine Catholic and Greek Orthodox this feast is also unique because it is celebrated as both a Great Feast of Our Lord, and a Great Feast of Our Lady, the Theotokos, and is known as: “Feast of the Presentation of our Lord, God, and Savior Jesus Christ in the Temple” or as “The Meeting of Our Lord, God and Savior Jesus Christ.” In the Eastern Rite, this beautiful festival is celebrated with a forefeast of one day, and an after feast of seven days (thus, I can assure myself that even though this post is late, it is still relevant….). 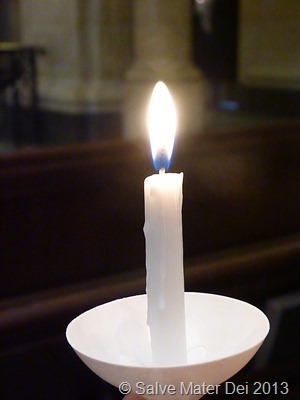 Often candles are blessed during the liturgical rites of this celebration and distributed among the faithful. Candlemas Celebration at Holy Hill, the Basilica of the National Shrine of Mary Help of Christians, February 2, 2013 © SalveMaterDei.com, 2013. The Book of Leviticus (12:1-4) stipulates that after giving birth to a male child, the woman was considered to be impure (excluded from taking part in public worship) for seven days, the child himself was to be circumcised on the eighth day, and the woman was to remain at home for an additional span of thirty days, in purification of her blood. After this time, she was to present a purification sacrifice – a burnt offering – of a young lamb, as well as a sin-offering of two turtle doves or young pigeons. The poor were absolved of the need to bring the young lamb. 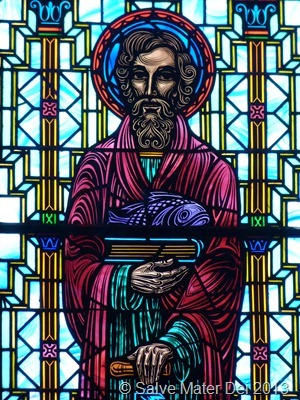 Thus, St. Luke stipulates that Mary and Joseph brought the offering of the poor: two turtle doves or young pigeons. In his book, Jesus of Nazareth: The Infancy Narratives, Pope Benedict notes that the entire Gospel makes it clear that Jesus and His family belonged to the poor of Israel, and it was therefore through the poor that the long awaited Messiah would fulfill the promise of salvation. It is precisely through the poor that God chose to offer His gift of salvation for all humankind. Candlemas Celebration, Holy Hill Basilica of the National Shrine of Mary Help of Christians, February 2, 2012 © SalveMaterDei.com, 2012. Our Lady is a model of poverty and obedience. 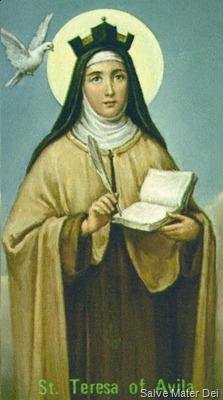 She did not excuse herself from the precepts of the law rather, in her holiness, she perfectly fulfilled scripture. Hail Full of Grace © SalveMaterDei.com, 2013. 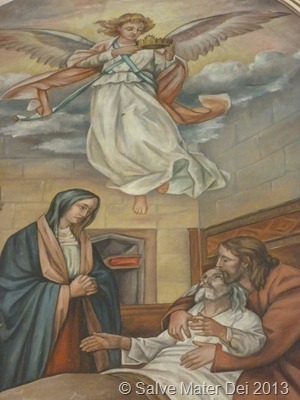 One might also consider that while because of her poverty, Our Lady was absolved of the requirement under the Mosaic Law to bring a young lamb to the temple as a purification sacrifice, in actuality He Whom she (and St. Joseph) brought to the temple IS the Ultimate Purification Sacrifice: the infant Lamb of GOD. It is precisely because of Our Lady’s spiritual poverty, her willingness to empty herself totally, and be filled with the grace of God (Hail Mary Full of Grace… kechatitomene – Kεχαριτωμένη-) that this privilege was bestowed upon her by Almighty God. 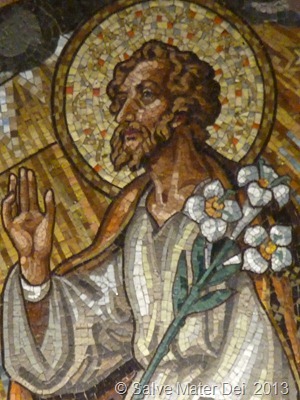 In Mosaic Law, the first-born male was to be redeemed, and a price of five shekels was to be paid to a priest. 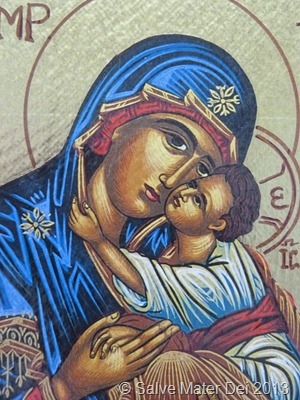 The first-born male child was thus to be given unreservedly to God: “Every male that opens the womb shall be called holy to the Lord (Exodus 13: 2).” In his text, the Holy Father points out that this prescribed action did not necessarily have to take place in the Temple. Yet, in Jesus’ case the Temple setting is absolutely essential to God’s plan. 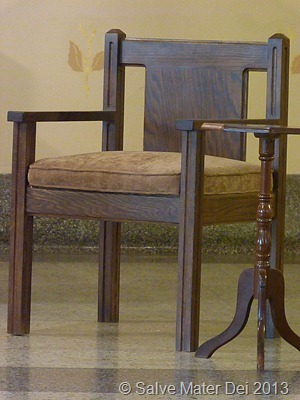 Recall, the Temple was considered to be the “footstool” of God’s presence for the people of Israel. In an authentic way the Temple was an indication of the validity of God’s presence among His people. In this encounter, The Redeemer of the World is redeemed according to the law, and by virtue of this act, Jesus is publicly handed over to God His Father. As Jesus is presented in the Temple, in a real way the Son of God is presented to God the Father. Thus, both acts are completed in this encounter in the Temple, the prescribed redemption under the law, and the Presentation of the Son to God the Father. 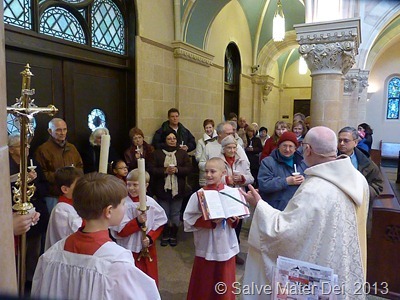 The Presentation of Our Lord Jesus Christ in the Temple, © SalveMaterDei.com, 2013. Simeon’s prophesy indicates the truth that the cross is intimately intertwined with the Messianic mission. Yes, the Christ-Child is the Salvation of Israel – and of all people – but to embrace the glory of Salvation, the Cross is essential. Candlemas celebration, February 2, 2013, Holy Hill, Basilica of the National Shrine of Mary Help of Christians © SalveMaterDei.com, 2013. This beautiful feast is replete with grace and meaning. 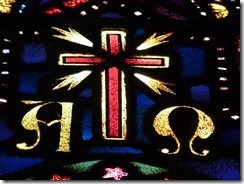 Scripture is fulfilled and we are invited to bear witness to the true Light which has come into the world. Just as Simeon and Anna encounter Christ, we too are invited to “see” Who He truly is – with the grace of the Holy Spirit – to encounter Him. 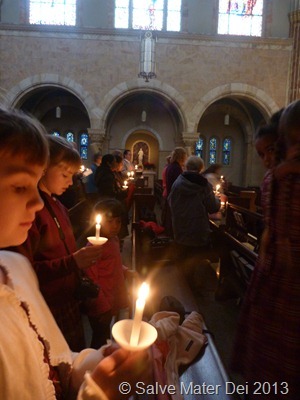 Like Simeon, we are also invited to “take the child into our arms” and bless God. Embracing Christ and His Cross, we too are invited to praise God for the gift of the Incarnate Word – Our Lord and Savior Jesus Christ. 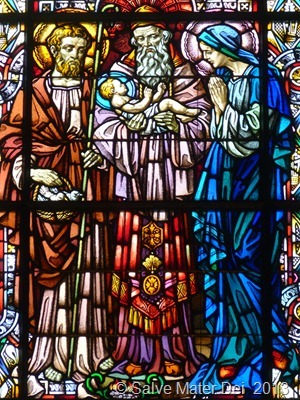 Blessed Feast of the Presentation of our Lord, God, and Savior Jesus Christ in the Temple; Joyous Candlemas!